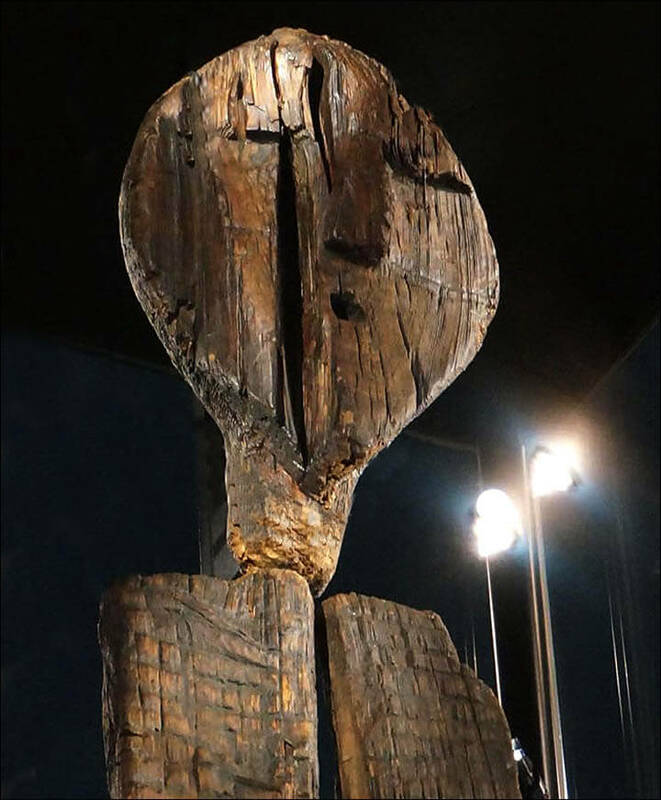 Home » The Shigir Idol, The World’s Oldest Wooden Statue! The Idol is the oldest wooden statue in the world, estimated as having been constructed approximately 9,500 years ago, and preserved as if in a time capsule in a peat bog on the western fringe of Siberian. Expert Svetlana Savchenko, chief keeper of Shigir Idol, believes that the structure’s faces carry encoded information from ancient man in the Mesolithic era of the Stone Age concerning their understanding of ‘the creation of the world’. German scientists are now close to a precise dating – within five decades – of the remarkable artifact, which is a stunning example of ancient man’s creativity. The results are likely to be known in late February or early March, The Siberian Times can reveal. Now the question is turning among academics to a better understanding of the symbols and pictograms on this majestic larch Idol, one of Russia’s great treasures, which is now on display a special glass sarcophagus at its permanent home, Yekaterinburg History Museum, where Savchenko is senior researcher. Professor Mikhail Zhilin, leading researcher of the Russian Academy of Sciences’ Institute of Archeology, explained: ‘We study the Idol with a feeling of awe. This is a masterpiece, carrying gigantic emotional value and force. It is a unique sculpture, there is nothing else in the world like this. It is very alive, and very complicated at the same time. He is adamant that we can draw conclusions about the sophistication of the people who created this masterpiece, probably scraping the larch with a stone ‘spoon’, even though the detail of the code remains an utter mystery to modern man. ‘It is obvious that the elements of geometrical ornament had some meaning,’ stated Savchenko and Zhilin in explaining the Idol’s ancient markings. ‘The difficulty of interpretation is the polysemy symbolism of these symbols’ – in other words, the possible multiple related meanings. According to ethnography, a straight line could denote land, or horizon – the boundary between earth and sky, water and sky, or the borderline between the worlds. Savchenko and other museum staff have postulated that among its purposes was that of an early map, or navigator. Straight lines, wave lines and arrows indicated ways of getting to the destination and the number of days for a journey, with waves meaning water path, straight lines meaning ravines, and arrows meaning hills, according to this theory which has yet to be fully researched. Author Petr Zolin, citing scientific work by Savchenko and Zhilin, stated: ‘The characters of Idol cannot have an unambiguous interpretation. If these are images of spirits that inhabited the human world in ancient times, the vertical position of figures (one above the other) probably relate to their hierarchy. The Idol reflects what these people looked like, with straight noses and high cheekbones. The Idol was preserved due to a stroke of luck concerning its resting place in the Urals. The scientists from the Lower Saxony State Office for Cultural Heritage are using AMS – accelerated mass spectrometry – enabling them to compare analysis of five microscopic samples of the larch from the idol with climate changes data for the past 10,000 years. This will allow them to figure out when exactly the 159 year old larch – from which the Idol is carved – grew. The tests follow what Professor Terberger called ‘a very successful summer trip’ in which ‘we worked together with our Russian colleagues from the Yekaterinburg History Museum’. The samples used for testing were cut in 1997. The Idol was extracted in several parts from the peat bog. Tragically, some of these fragments were later lost, so only Tolmachev’s drawings of them remain.However, these suggest the original height of the statue was 5.3 metres. Some 1.93 metres of the statue did not survive the 20th century’s revolutions and wars and it is only visible on his drawings. One intriguing question debated by Russian scientists is how the Idol – as tall as a two-storey house – was kept in a vertical position.